The study of flight dynamics requires a thorough understanding of the theory of the stability and control of aircraft, an appreciation of flight control systems and a grounding in the theory of automatic control. 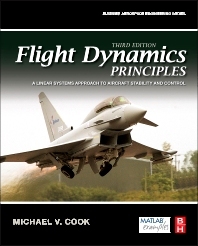 Flight Dynamics Principles is a student focused text and provides easy access to all three topics in an integrated modern systems context. Written for those coming to the subject for the first time, the book provides a secure foundation from which to move on to more advanced topics such as, non-linear flight dynamics, flight simulation, handling qualities and advanced flight control. After graduating Michael Cook joined Elliott Flight Automation as a Systems Engineer and contributed flight control systems design to several major projects. Later he joined the College of Aeronautics to research and teach flight dynamics, experimental flight mechanics and flight control. Previously leader of the Dynamics, Simulation and Control Research Group he is now retired and continues to provide part time support. In 2003 the Group was recognised as the Preferred Academic Capability Partner for Flight Dynamics by BAE SYSTEMS and in 2007 he received a Chairman’s Bronze award for his contribution to a joint UAV research programme.